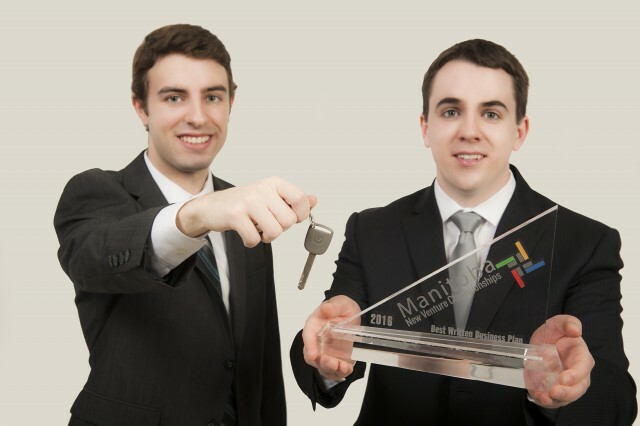 Michael Gall, left, and Tanner Price won the award for Best Written Business Plan at the Manitoba New Venture Championships in Winnipeg for their plan for Precision Vehicle Transport. BRANDON, Man. – A well-written business can put an entrepreneur in the driver’s seat. That was the experience for a pair of Brandon University (BU) students at the recent Manitoba New Venture Championships, hosted by the Stu Clark Centre for Entrepreneurship at the University of Manitoba’s Asper School of Business. Michael Gall and Tanner Price of BU’s Business Administration program won first place in the Best-Written Business Plan portion of the competition. Gall and Price submitted their plan for Precision Vehicle Transport, a service that would pick up vehicles for warranty and other maintenance work, and then return them to the customers. The New Venture Championships featured 12 teams of students from Manitoba’s post-secondary institutions pitching their ideas to a panel of judges from Winnipeg’s business community.